This time water and waterfalls! One of our original reference points for the water and the look of the game in general is Ni No Kuni, we decided quite early on that we wanted a look for the water similar to that game. 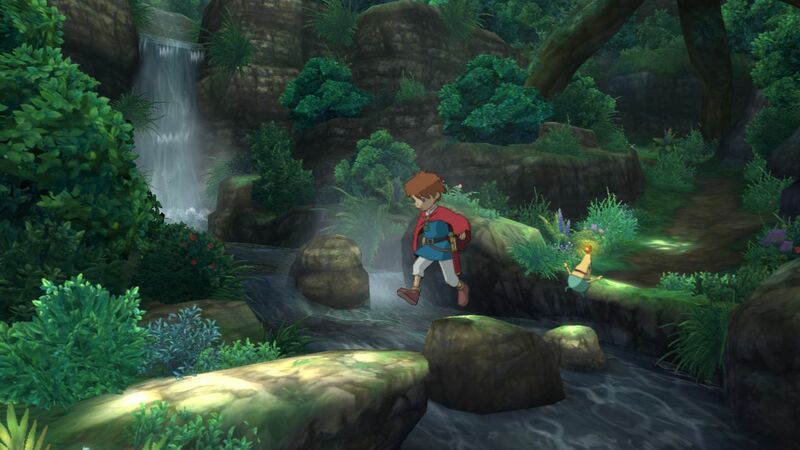 Ni No Kuni waterfall and streams. I got started on the waterfall first, thinking it would be easiest because it is basically a panning texture. I created a mesh for the waterfalls, painting the vertex colour of the edges to black so the waterfall has a nice fade out on the sides, then made a texture with different masks on each channel, which I used to create the panning effects on the waterfall. Waterfall and water shader uses similar setup. The surface water was a bit different as we wanted some degree of reflection so I set the material type to a surface translucency volume, there is also a little bit of refraction, the hard part was keeping it within the look of our level. I made everything fully parameterized so I can go back and make quick alterations if needed. The last thing I had to add was a fake fog layer to the material as for some reason the height fog in the level doesn't affect the water surface. To fix this I used a slightly hacky way of adding the fog colour to the emissive input and using scene depth to mask it, helping the water to blend in to it's surroundings properly.